By rights, I should have loved this book. It’s a family saga, focussed firmly on the female characters; it’s based largely in Melbourne; it covers 1917-1990 and is rich with social history. It is written in five parts, encompassing seven separate chapters. Each of the chapters is named for its female protagonist, followed by location and year (e.g. Alma, Footscray 1917; Anna, Cockatoo 1990.) So it is a book firmly anchored in its characters who are embedded into a particular place and time- usually a structure and concept that I enjoy. However, in this case, I found myself dissatisfied. There are four mothers in this novel. The book opens with Alma, who has walked out on her adulterous husband with her two children in 1917, at a time long before Supporting Mothers’ benefits and in the midst of WWI. Homeless and without support, she is taken in by Alfred Lovett and his mother. It is when she falls pregnant to Alfred that the relationship sours, and under pressure from his mother, Alfred pays for Alma, her two children and her new daughter Molly to shift to Seddon. When this arrangement falls through, Alma cannot afford to support her daughter and so young Molly is sent to the Melbourne Orphan Asylum in Brighton. Jones writes a nuanced account of Molly’s time at the orphanage: it is not a horror story of deprivation or cruelty, but a stripped down, anxious time. Molly does rejoin her family and marries, but does not fall pregnant. The second mother is Anna, an unmarried, pregnant twenty-year old girl from Cockatoo who is brought to the Salvation Army ‘Haven‘ in Alfred Cres, near Edinburgh Gardens in North Fitzroy in 1952. But this institution was no haven: instead it was part of the twentieth-century adoption process-line so heartbreakingly detailed in the Senate Inquiry into Forced Adoption Practices of 2012. I read this section with a sinking feeling of inevitability and found it the most compelling part of the book. It comes as no surprise, really, that the adoptive mother- the third mother in the book- is Molly who, in many ways, projects the insecurities of her orphanage experience onto her adopted child, David. The fourth mother of the book is Cathy, David’s girlfriend in 1975. Cathy, too, is pregnant but it’s a completely different scenario in Whitlam’s Australia than the one faced by David’s unknown biological grandmother Alma when she fell pregnant in post WWI Footscray. David, the father of Cathy’s child, is prickly and restless, reluctant to engage with the bourgeois conceit of marriage. He is aware that he had been adopted but unwilling at that stage to follow it up any further. It is not until the 1990s, in the final chapter of the book, that there is a coming together – an awkward, tentative and inconclusive coming together- of his birth and adoptive mothers. So, why didn’t I fall in love with this book? Part of it, for me, was its rather self-conscious attempt to be historically grounded. Much as I love Trove,( and I truly do), I wonder sometimes if it’s not strangling Australian historical fiction by enticing writers to indulge in a form of literary product placement. There were too many details that Jones seemed unable to omit, and rather than adding authenticity, I felt as if I were being conducted around a movie set. This was compounded by the very simple writing style that Jones uses. I found myself craving something that was meatier- although not in an emotional sense because he did manage to get inside his characters’ consciousness, and equally well for both his male and female characters. But this was achieved through a succession of many short sentences, and I felt as if I was being written-down-to. This is a book about hard things, and I wanted the language to match it. 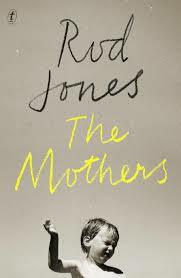 In an article written by Jane Sullivan about an interview with the author, we learn that Rod Jones was adopted and that this very much is his story. Perhaps we need to read it as fictionalized memoir, and acknowledge the pain that seeps through it. But it’s much more than the “penitential exercise, however worthy” that Peter Pierce denigated it as in his review in the Australian, and it has an emotional integrity that shines through. I just felt that it was smothered by the period detail and short-changed by the writing. This entry was posted in Australian literature, Book reviews. Bookmark the permalink.